Bulgaria’s IPRI score increased by 0.585 to 5.397 placing it 11th in the Central Eastern Europe and Central Asia region and 63rd in the world. Bulgaria is classified by the IMF as part of the Emerging and Developing Europe group and by the World Bank as Upper middle income country. Bulgaria’s Legal and Political Subindex increased by 0.149 to 4.563 with scores of 3.325 in Judicial Independence, 4.924 in Rule of Law, 5.326 in Political Stability, and 4.677 in Control of Corruption. Bulgaria’s Physical Property Rights Subindex increased by 1.335 to 6.137 with scores of 4.183 in perception of Property Rights Protection, 9.328 in Registering Property, and 4.902 in Ease of Access to Loans. 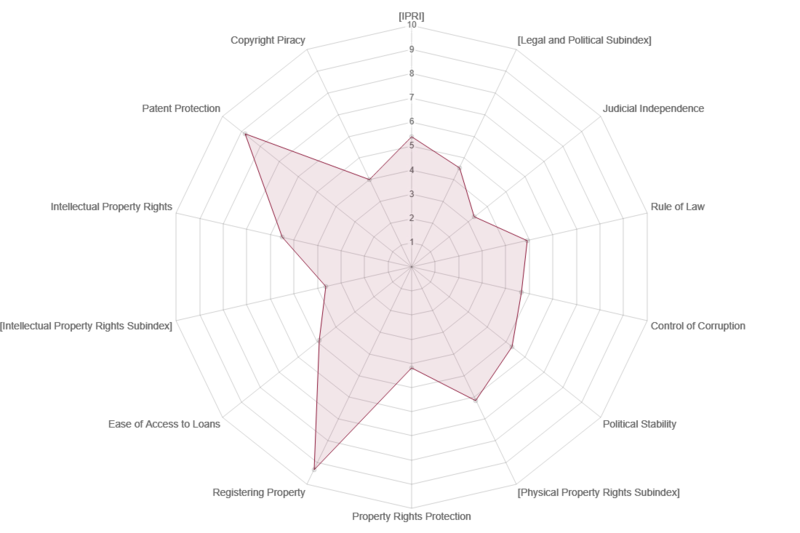 Bulgaria’s Intellectual Property Rights Subindex increased by 0.271 to 5.492 with scores of 3.644 in perception of Intellectual Property Protection, 8.833 in Patent Protection, and 4 in Copyright Protection.